Pb banana chocolate chip bacon cookies! 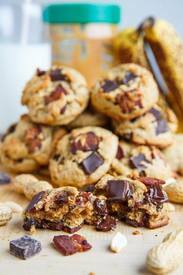 This is it, the ultimate peanut butter cookie with bananas, chocolate, honey roasted peanuts and Bacon!! These soft and chewy banana peanut butter cookies with chocolate chunks and Bacon are just as easy to make as the original and so much better! I mean, Bacon in cookies? Peanut butter cookies even? Yum!